Saxophonist Khris Royal's ancestors Nace and Biby Butler were among the people sold by the Jesuits of Maryland down to plantations in Southern Louisiana in 1838. Royal represents the living tradition of jazz music in New Orleans, and he consistently explores and re-imagines the relations between jazz, funk, rock, and hip hop. He has played with a wide range of artists including Lettuce; Bobby Brown; Alvin Batiste; Ellis Marsalis; Christian Scott; Branford, Delfeayo and Jason Marsalis; Tony Clifton; The Sam Kininger Band; and Johnta Austin. Royal has also recorded with Mary J. Blige, Ashanti, Nelly and The Game, Erykah Badu, and D.J. Quick. He composed and performed the soundtrack for the award-winning short film ANNA (2018), which will also screen on campus at 7 p.m. on Thursday, March 14, in the Film Screening Classroom, New South Building. ANNA tells the story of Ann Williams and her struggle to secure freedom from slavery for herself and her family. Through telling Williams's story in music, Royal uses cultural expression to call for racial justice. 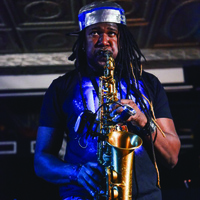 On March 15, Khris Royal will perform with his group Dark Matter as part of Friday Music, reconnecting Georgetown with New Orleans, and reminding us of the journey and struggle of the GU272 and the ongoing work of reconciliation.